Dawnguard was the first of the big add ons for the already gigantic Skyrim. 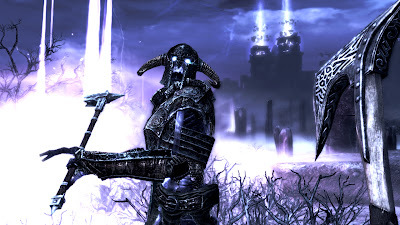 Dawnguard concerns a battle between Vampires and vampire hunters and features as well as a load of new missions a couple of new areas, enemy types and weapons as well as the rather pointless ability to fight while on horseback now. After hearing rumours of a vampire hunters retreat in the mountains you set out to find it. Joining the order you infiltrate a dungeon complex where you discover a pure vampire imprisoned in a tomb who is also in possession of an Elder Scroll. Escorting her home you get given a choice; either join her family and become a vampire, or leave and stay with the vampire hunters. Whichever choice you make the missions are pretty much identical, you most stop a Vampire Lord from using dark magic to make the world eternal night. The vampires are a pain to fight in Skyrim thanks to their health stealing magic. I set out fully intending not to join them. I never meant to go to the evil path but the choice of becoming a vampire or staying a damn werewolf (I don't like werewolves) gave me no choice. 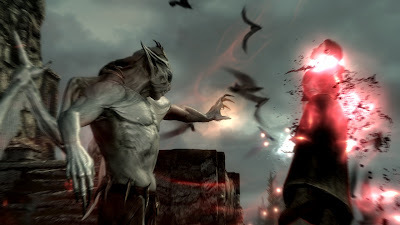 As a vampire you are able to transform into a demon form which hovers off the ground. Unfortunately and rather bizarrely this means you are unable to enter many doorways or search items and unlock doors without a lengthy transition back into your human form. 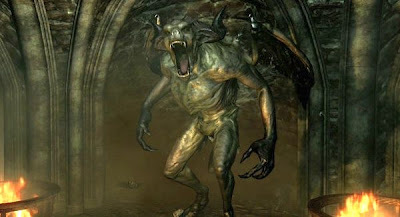 The demon form gives you increased power, the ability to turn into bats or mist, and the ability to fire magical energy that steals your victims health. You are able to also hypnotise humans to obey your commands. Oblivion badly punished you for being a vampire making fast travel impossible thanks to the sun constantly hurting you. Here this is not a problem, also here you now get a skill tree specific to either a werewolf or vampire that lets you unlock new and better abilities. The missions themselves are not too bad, some complaints that a couple of missions have you going to spookily identical new dungeon layouts. The vampires castle is great fun, the mission involving you entering an abandoned part of it fighting stone gargoyles and skeletons was quite good. The best mission by far was an optional one that saw you investigating various Dwarfish ruins with a ghost. The size and scale of these dungeons was amazing, gigantic caves, quite breath taking. A few of the missions take you to completely new places. One had you investigate the giant battlefields of a soul gem, wide, wide open spaces and strange architecture but kinda empty. Another mission saw you meet up with a new race (one thought extinct at least) and go to weird and wonderful dimensions fighting lots of the games version of goblins. Led to a great looking boss fight against someone who rains down bits of ceiling on to you so that by the end of the fight the giant chamber you are in has been totally destroyed! Plot wise this is pretty damn terrible with some awful characters but as a game extending device it worked very well with lots of new looking locations that really were for the most part very well designed. 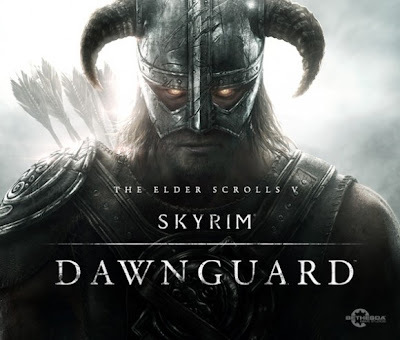 I was at around 92 hours when I started Dawnguard. By the end of my dalliance back into Skyrim I was over 110 hours so is worth the asking price.